On the 23rd and 24th of January 2019, NeuroSchool had the pleasure to receive 10 local and European speakers for the annual symposium of 2nd year neuroscience MSc students. During two days, our students expanded their knowledge and discovered state-of-the art approaches in neuro-imaging. Read a student’s reaction and learn more about the annual symposium in this article. What do students think about the NeuroSchool MSc symposium? Can you introduce yourself in a few words? What neuroscience field are you the most interested in? “My name is Charles Dabard, I’m a second year Master’s student in neuroscience and I have a bit of an atypical background. I first studied sports science then I did a Bachelor’s degree in neuroscience. Was the symposium interesting? Did you learn something new? “It was interesting in many ways because it was about various topics. I mostly studied cognitive and behavioral aspects of neuroscience but the symposium was about other subjects. For example, I learned that it is possible to apply algorithms on fluorescent images to detect spiking neural activity, it was very interesting! I even talked about it with the veterinarian that is involved in my internship and he was able to explain me more in details how it works. So cool! During the symposium I discovered cellular and molecular exploration methods but also deepened my knowledge about functional imaging […]. Would you have looked into these subjects without the symposium? Do you think that you’ll reuse at least part of what you learned during your upcoming internship? What about the speakers’ introduction and the debate animation by the students? Why is the symposium interesting for MSc students? Every year, the Master’s degree in neuroscience organize a two-days symposium for their second-year students. 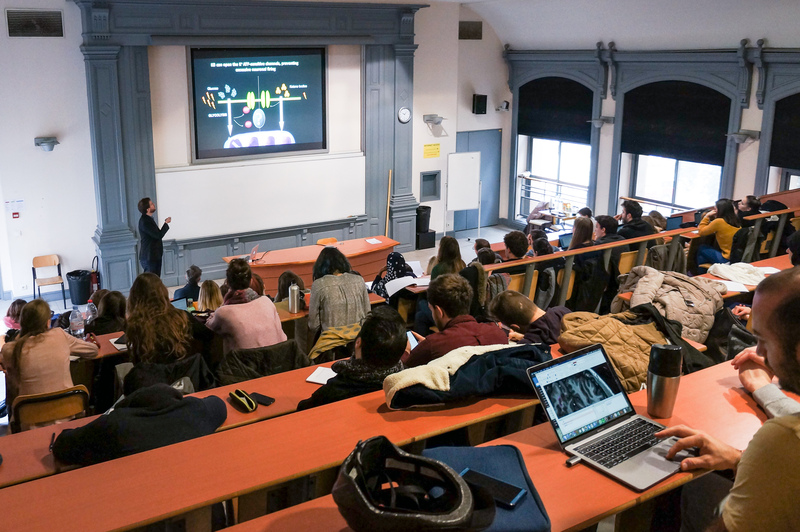 French and European scientists, experts of the annual topic, come to Marseille to speak about their researches and latest advancements as they would do in a research symposium. An opportunity to show their lab’s excellence, meet soon-to-be colleagues and maybe even recruit some of them for an internship! The event allow students to learn more about state-of-the-art methods and approaches, beyond those they can access with their courses. Since the speeches are given by experts, it is an excellent opportunity to hear about the latest publications on the subject and be sure that the shared knowledge are up-to-date. Furthermore, it is an additional professional experience as the students need to read beforehand about the speakers’ work, introduce them and take notes to ask questions and debate after the speech. All of the speeches and interactions are done in English. How does neuroscience benefit from imaging methods? This year, the symposium topic was “Imaging and neuroscience”. Why is it an essential question? Our neural system and its cells are hardly observable, mainly locked behind our skull and spine. It is therefore necessary to develop methods and tools to directly or indirectly access it, observe it and record its activity to better understand how it works. The speakers invited this year spoke about their scientific team’s work (ranging from molecular approaches to the most integrative and cognitive ones) and how novel imaging methods are helping them explore the nervous system. Read the full program here. For example, during his speech, Christophe Leterrier, from the Institute for Neurophysiopathology, showed how a method called Single Molecule Localization Microscopy (SMLM) allows his research team to observe neural cells and their molecular composition with unbeaten spatial resolution (down to the molecular arrangement of protein complexes). Combined with another method called DNA-PAINT, they can describe very precisely radial axon organization and therefore could better understand cellular functions like slow axonal transport. More about their recent publications here.